The elegant MS Princess Aloha offers an exceptional small ship cruising experience. The 38 m vessel features 18 spacious and comfortable cabins with private en suite facilities and a host of amenities. The communal spaces include an upper deck air-conditioned salon-restaurant, with extended alfresco seating area, and a bar with LCD TV and complimentary WiFi service. The large sun deck offers ample relaxation opportunities on sun loungers that are positioned in direct sunlight. A shady canopy provides an escape from the sun. There is also a swimming platform located at the rear. The MS Princess Aloha boasts state-of-the-art equipment and the latest safety features for optimal cruising comfort. The 38 m cruiser comfortably accommodates up to 38 guests in 18 twin and double cabins. 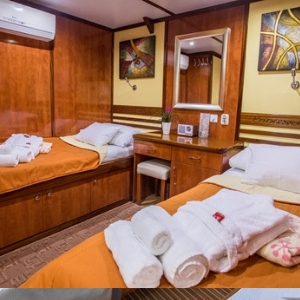 All of the standard, elegantly furnished cabins are air-conditioned and feature a private en suite bathroom. Windows and portholes take care of the views. The public areas include a spacious salon-restaurant with panoramic vistas that seats all diners in a single sitting. There is also a bar and an outdoor seating area. 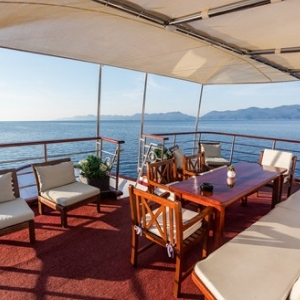 The large sun deck is partially canopied and equipped with plenty of sun loungers. 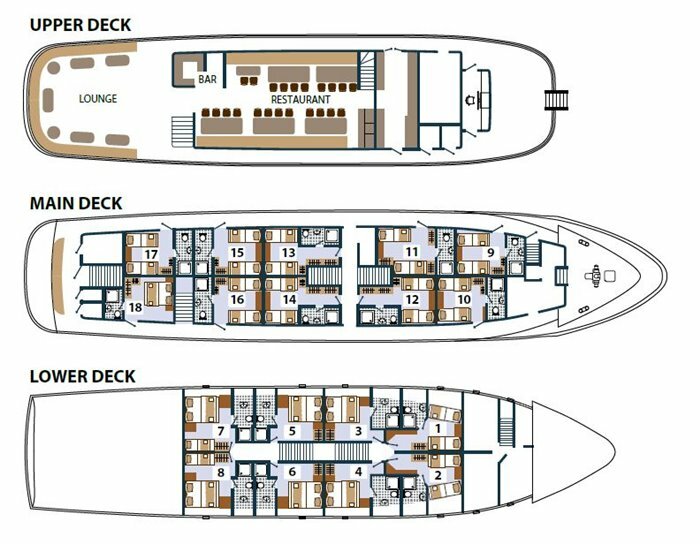 The 18 standard twin and double cabins offer a relaxing private space for guests to unwind. Each cabin has its own en suite bathroom, window or porthole views, flat-screen TV, wardrobe, desk, in-room safe and hairdryer. Air-conditioning and complimentary toiletries are inclusive additional benefits. The cabins are elegantly presented and feature authentic timber styling and modern neutral tone linens and fabrics. The cabins provide flexible bedding configurations to accommodate up to 38 guests. On board the MS Princess Aloha there are ample public spaces in which guests can relax and socialise. The expansive alfresco seating area is linked to the bar, and is furnished with comfortable sofa and armchair seating arrangements and tables. To the main deck interior is the spacious air-conditioned salon-restaurant that features stylish banquette style seating and large panoramic windows. The décor is elegant and classic. 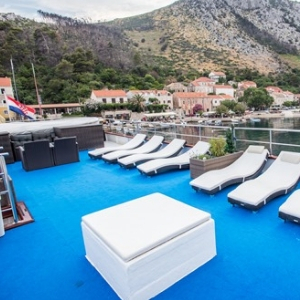 The sun deck offers shading from the sun and sun loungers for maximum relaxation. Should you wish to take a dip during a swim stop, access the swimming platform located at the rear.